We are working to establish legal rights for the Southern Resident Orcas. Under our current legal system humans and corporations have legal standing but animals and ecosystems don’t. We believe that animals and ecosystems should also have legal rights and be able to defend those rights in court. What is a Southern Resident Orca? The Southern Resident Orca, or Killer Whale (SRO) can be found in the Salish Sea, stretching from the north end of the Strait of Georgia in Canada, to the south end of the Puget Sound and west to include the Strait of Juan de Fuca. Transient Whales (or Bigg’s) are visitors of the Puget Sound, tend to be smaller pods, and are often seen hunting off the coasts of Washington, Oregon, California and Alaska. There are physical differences amongst the two whales (dorsal fins, saddle patches) and they have different acoustics. Residents have large social circles within a community and across generations, while it is not uncommon for a mother and child Transient to live separate from others. However, The biggest difference between Transient and Resident populations are their preferences in food. Residents feed primarily on Chinook Salmon from late spring through late summer, while Transients hunt for larger marine mammals such as seals, sea lions and other whale species. Southern Residents are the only Orca population listed under the Endangered Species Act. There is one clan (J) that consists of three pods (J, K & L). Despite being protected under the Endangered Species Act since 2005, their numbers have significantly declined and there are only 74 Southern Resident Orcas remaining. They depend heavily on the health and proper management of the Salish Sea. Why are the Orcas threatened? More than 8 million people live in the communities surrounding the Salish Sea. The main threats to SRKW are vessel traffic, sound exposure, chemical contamination and prey availability. Vessel traffic disrupts the foraging behavior of Orcas When in proximity of vessels the short-term behavioral changes of Orcas lead to biologically significant consequences. For example, reduction in time spent foraging, reduced prey capture and decreased energy acquisition. Sound exposure from vessel traffic, including whale watching vessels, contributes to the overall ambient noise in the water. Southern Resident Orcas produce a wide variety of clicks, whistles, and pulsed calls for echolocation to signal each other while cooperatively foraging and traveling. Interruption of these signals deteriorates the cohesion within the group and the detection of important food sources. It is important to mention, the overall effects of vessel noise pollution can also bring about psychological stress, creating overwhelming and disorienting circumstances for the Orca. Southern Resident Orcas are among the most contaminated marine mammals in the world, due to high levels of anthropogenic chemicals that accumulate in their tissues. Pollution and contaminants such as DDT and PCBs have detrimental physiological effects on Orcas and have been linked to restricting the development of their reproductive system. The rapidly decreasing population of Chinook salmon effects the Orcas as it is almost 80% of their diet. It is important to ensure a healthy recovery of salmon populations and all fish populations for their own sake and regulate human consumption, with consideration for other species needs, such as the SRO. What does “Legal Rights for the Southern Resident Orca” mean? Establishing legal rights for the Southern Resident Orca gives them the same basic rights as people and corporations, and enables the defense of the SRKW in courts. Establishing proper governance “guardianships” within a marine protected area framework would help manage and ensure the Orcas rights through representation. When the Orcas are given their basic rights we can prevent their extinction. To do this, we must protect their habitat, their natural food, and their physical and mental bodies. ~After acquiring the above rights, Southern Resident Orcas would benefit almost immediately as many life-threatening situations they face would dissipate naturally. For example, normal behavior is affected by the number of vessels in the water, their presence and noise prevent Orcas from searching for food. Their reproductive abilities are also affected by pollution and malnutrition, due to loss of Chinook Salmon populations. The whale watching industry could be considered liable for coercing Orcas at times, in order to ensure tourists “get their money’s worth”. And all of the above would factor into Southern Resident Orca’s right to live free from human induced harm. By giving SRKW the above rights we are ensuring their basic needs can be met, we are taking moral recognition of the importance of their lives, and allowing them to co-exist with humans, the Puget Sound and the Salish Sea, not apart from them. Why do the Orcas have rights in the first place? Rights of Nature is about the recognition of already existing rights. Just as we say humans have inherent rights for existing, so too does all life have inherent rights for being. Orcas have the second-biggest brains among all ocean mammals, weighing as much as 15 pounds. It’s not clear whether they are as well-endowed with memory cells as humans, but scientists have found they are amazingly well-wired for sensing and analyzing their watery, three-dimensional environment. Bigger animals typically have bigger masses of brain cells, but scientists use brain-weight-to-body-weight ratios as a rough measure of intelligence. Orcas’ brains are 2 1/2 times average — similar to those of chimpanzees. However, brain size is only a small reason why scientists believe these animals are highly sentient beings. Sentience is the capacity to feel, perceive or experience subjectively. In the philosophies of animal welfare and rights, sentience implies the ability to experience pleasure and pain. Orcas are emotional beings, they can process feelings of happiness and sadness, curiosity, self-awareness and social dynamics. Emory University neurobiologist Lori Marino says, “The limbic system of their brain is so large that it erupts into the cortex to form an extra paralimbic lobe. This leads researchers to believe that Orcas are capable of mixing emotional and cognitive thinking.” In addition, spindle neurons associated with an organism’s ability to “recognize, remember, reason, communicate, perceive, adapt to change, problem solve and understand” have been isolated in the brains of both whales and dolphins, which suggests that whales do a lot more thinking than previously thought. Orca pods are led by females, and in the case of the Southern Residents, a deeply embedded matrilineal organization within a larger community. These are some of the most complex family structures in the animal kingdom. Their young stay with them for life and they have developed specific sonor clicks, pulses and whistles for communication within each individual group. This means each pod has its own dialect. They use body language to show affection and send messages to others, they live to a ripe old age, their hunting techniques are passed down through generations, they protect their young, ill and injured, just like we do. What do “rights” give people, corporations and animals? Stephen L. Burr explains “rights” in Toward Legal Rights for Animals. “In a society such as ours, where formal interhuman and human governmental relationships are controlled by laws, the amount of protection one receives is a function of the legal rights one holds. Fundamentally, a legal right involves the assurance by society that when another person acts inconsistently with a right that you hold, an authoritative public body will give some amount of consideration to your protest. Real protection in our legal system, then, involves more than protection as mere property. It involves the right to be heard, the right to be treated as having a unique worth. Such protection has not been limited exclusively to humans. Corporations, ships and governmental entities all are granted legal identity. Obviously, these non-human parties could not appear in court to seek remedy for injuries unless human spokesmen could argue in their behalf. Yet we have been willing to confer on them the status of rights-holders because we have made the judgment that they are sufficiently unique and valuable to deserve protection in and of themselves. Why not use existing “solutions” like environmental laws and regulations? How will legal rights save Southern Resident Orcas? Despite international laws and agreements designed to sustain and protect the ocean, marine biodiversity and health is in decline. This is because we largely value the ocean as resource and property, rather than a life-giving partner. As a result, current environmental laws still allow pollution and degradation, slowing environmental decline rather than preventing or restoring environmental health. Over 113 marine species are considered “at risk or vulnerable to extinction.” And despite its listing under the Endangered Species Act in 2005, the Southern Resident population continues to decline, with 75 individuals left. Whales that live off the coast of Seattle, Tacoma and other cities are effectively urban whales buffeted by municipal and industrial waste, and the occasional spillage from wastewater treatment plants into the ocean. Killer whales carry some of the highest levels of pollution of any marine animal. Boeing disclosed this spring that over the past five years it had discharged highly toxic PCBs into the Duwamish River, which flows into Puget Sound, thousands of times over the legal limit. The Orcas are also facing a new threat. The Canadian government and Kinder Morgan wish to expand the controversial Trans Mountain Pipeline, doing so would multiply oil tanker traffic through the Orcas’ habitat by seven times, according to some estimates, and expose them to excessive noise and potential spills. 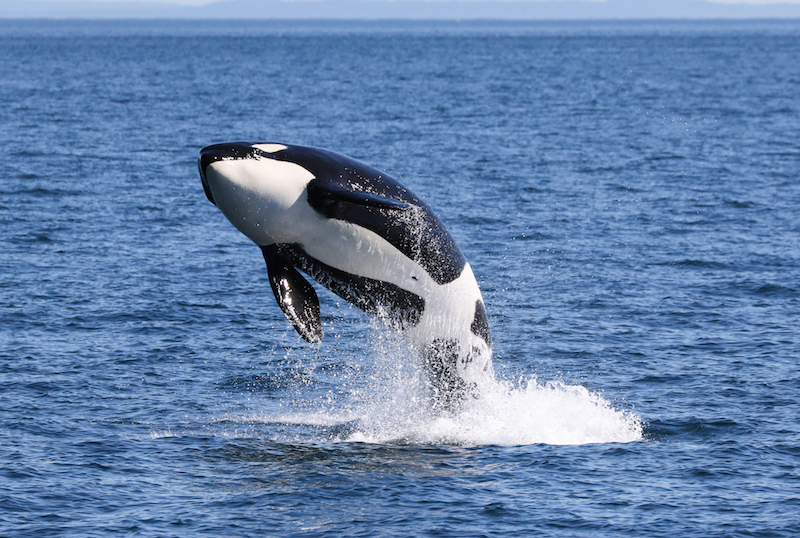 Legal rights for the Southern Resident Orcas will ensure an equal opportunity to flourish and exist, allow them to live in harmony with people, have access to all that sustains them, especially Chinook Salmon, and to live without the disastrous side-effects of manmade chemicals and development. And despite our current laws and regulations, they are still facing very severe threats to their livelihood. By giving Orcas their legal rights we are giving them a chance to replenish their populations, live healthfully, and peacefully, before it is too late. What about giving legal rights to the Salish Sea? How does this affect the Southern Residents? Giving legal rights to the Salish Sea will require the full implementation of solutions to address the threats to Southern Resident Orcas, identified as prey availability, noise pollution and vessel traffic, and buildup of contaminants. Regulations and actions would be implemented immediately, including breaching dams to restore salmon populations, working with fishermen to enforce new fishery regulations, reducing vessel traffic in critical areas and reducing chemical discharge from industrial facilities. Solutions will be implemented by adequately balancing the needs of the entire ecosystem. All species will be on a level playing field, rather than traditional cost-benefit analysis, only focusing on the costs to humans in the short term. In what ways will this be beneficial for the future of our communities? Over 8 million people live in the communities surrounding the Salish Sea. Their lives and well-being depend on the health of the Salish Sea and its inhabitants. It provides the oxygen we breathe, absorbs and sequesters climate change causing carbon dioxide emissions, provides protection from extreme weather events and provides a source of food and livelihoods. Local communities will now have the right to defend and protect Southern Resident Orcas and hold those accountable for violating the community’s rights to a healthy Salish Sea environment. In addition, local communities will have the responsibility to be good stewards for future generations. It has been proven that Marine Protected Areas reduce poverty, build food security, create employment and protect coastal communities from the adverse effects of climate change. Will ​rights​ ​for the Southern Resident Orca​ ​prevent​ ​further​ ​economic​ ​growth​ ​or​ ​negatively​ ​impact​ ​our​ ​GDP? It is important to note that legal rights does not cease development, but instead requires development to be made in a truly holistic, systemic, precautionary and rights-based way. Holistic and sustainable decisions benefit our economy. ~The cumulative economic impact of poor ocean management practices costs USD 200 billion per year (UNDP, 2012). ~A significant oil spill could cost WA state an average of $10.8 billion (based on 2006 estimates) and adversely affect 165,000 jobs. ~In BC’s lower mainland aquatic near-shore services such as flood protection, water supply, and critical habitat for fish and other animals are estimated to provide between $30 and $60 billion in benefits each year. In Puget Sound, valuing 14 goods, services and benefits including climate regulation, pollination, water supply and treatment, nutrient cycling, and recreation, amongst others, shows between $10 and $80 billion are provided each year in benefits. As context, the GDP of BC and Washington combined was about $630 billion in 2012. ~The Puget Sound region supports 88,000 tourism related jobs and generates $3 billion in spending. The value of the overall whale watching industry in Washington State is worth at least $65-$70 million annually, with an average annual growth rate of 3%. ~Renewable energy sources have replaced the output of the Lower Snake dams several times over and the dams do not provide peaking power due to low flows and fish passage limitations. What does this mean for my property rights? What would this mean for whale watching, how will it affect employees and tourists? The whale watching industry will inevitably face stricter regulations if we are to truly give the Southern Residents the space and freedom they need to live life. It would mean less outings, less noise, less boat pollution and more space for the Orcas It would likely increase costs to tourists to visit the whales. However, it is important to recognize that without the SROs, the industry and whale watching tourism in the Puget Sound (and much of the Salish Sea) would cease to exist all together. The premise of whale watching is based upon a love, or at least an interest in the local species. If tourists want to experience a real and genuine interaction with the Orcas in their natural habitat, then the species must still exist. Overall, creating stricter regulations for the sake of Southern Residents, would in turn make whale watching a more desirable, memorable and authentic experience for all parties involved. What does this mean for human and indigenous rights? The establishment of rights of nature, and in this case, rights of the Southern Residents does not eliminate recognition of human rights. It means leveling the playing field so that not only corporations and humans have rights, but nature does also. All relevant stakeholders and their rights will be represented, including fishermen, industry, tourism, indigenous groups, and non-human species. When inevitable conflicts occur between human and Southern Resident Orca’s rights, the courts will resolve – as they do when there are conflicts between human rights today. Rights of nature is in line with indigenous culture’s traditional worldview. Rooted in indigenous knowledge is a deep respect and understanding that nature and humans are intimately connected, and nature and what it provides does not belong to just humans. For centuries, indigenous peoples have lived in harmony with the ecosystems they are a part of. How would this new framework align with existing laws? This law is intended to evolve and complement, rather than override, existing legislation. In other words, existing laws for decision making remain in place, but will be influenced by this new holistic ‘lens’. It requires that all decisions, powers and functions that involve or may affect the Southern Residents, consider their inherent rights, and that the Southern Residents have human representation of their interests in decision-making and disputes. Changing state and federal law perspectives related to recognizing nature with rights are crucial in creating a holistic approach to representing the rights of nature. Examples of the Earth Law Lens can be applied to several federal and Washington State laws listed below. The Beach Environmental Assessment and Coastal Health Act (BEACH) works to establish and implement the most recent water quality standards. Legal rights for the Salish Sea would expand the range of water quality standards and pathogen indicators to include those harmful to all “users” and inhabitants of coastal recreational areas. “Healthy” standards for all aquatic life would be reflected within the function of the act. The Clean Water Act monitors and manages the discharge of waste and pollutants into our waterways using a national permit system. Under Earth law, the Salish Sea would have the legal standing to dispute permits distributed by the National Pollution Discharge Elimination System when such pollution may significantly impact any aquatic ecosystems. The Endangered Species Act provides that action taken by any federal agencies does not significantly impact endangered or threatened species or habitat. Such action also includes the ban of foreign and interstate commerce of any listed species. Under a great holistic approach, the range of protections for species would be expanded to include preventative measures for species that are projected to become threatened. The National Environmental Policy Act requires that federal agencies assess any environmental impacts that any actions may have. Impact Reports and Assessments may be changed to include holistic assessments to examine impacts not only associated with human impact but also long term impacts on connected actions that follow in the environment. The Marine Mammal Protection Act prohibits the taking (harass, hunt, feed, kill, capture, or collect) of any marine animal without a permit. Under the implementation of holistic inclusion, marine animals, such as the Southern Resident, would have the ability to review any and all permits and have legal standing to dispute approve any action that could significantly disrupt any and all rights allocated to them. The Watershed Planning Act addresses issues concerning water management by allowing local governments and citizens to create watershed management plans with aid from state agencies. Local government and citizen effort into establishing watershed plans should also include the impacts that such plans may have on species reliant upon the movement of the watershed based upon the most relevant and current scientific studies. Local groups have the power to create watershed plan from which impacts on wildlife and biodiversity should also be included and represented in such reports. The creation of the Southern Resident Killer Whale Recovery and Task Force calls for action to prioritize the protection of the Southern Residents by analyzing current efforts and creating new initiatives. The creation of task force for the SRO is an example of allocating a recognition of significance to Salish Sea species inhabitants. A separate task force may be created with the specific goal of allocating and representing the rights of the Salish Sea in local and state affairs. Such a group could recommend the best course of action pertaining to any and all permits associated with impacting changes in the Salish Sea ecosystem. Where else has a “Rights of Nature” framework been implemented? ~In 2010, a conference held on Cetacean Rights in Helsinki produced a Declaration on the Rights of Cetaceans for universal adoption. ~Also in 2014, San Francisco passed the “Free and Safe Passage of Whales and Dolphins in San Francisco’s Coastal Waters” Resolution supporting the free and safe passage of cetaceans in their waters and to be free from captivity. ~Laws prohibiting cetaceans in captivity are growing internationally. ~Ecuador, Bolivia and Mexico City now protect Rights of Nature in their constitutions or national law. ~Colombia declared both the Atrato River and Colombia Amazon as a “legal entity subject to basic rights” through court decisions. ~Court cases in Ecuador highlight how rights of nature improves enforcement and supports conservation efforts, especially in regards to the Galapagos. ~The Belize Barrier Reef was recognized as subject of rights. Adoption of an indefinite moratorium signed into law on 29 December 2017 to preserve the World Heritage site reef builds on earlier recognition of Nature as subject of rights.